The chairs are shorter than I thought they would be, but I really love them. One chair was repaired by the manufacturer - it was painted and clearcoated. Overstock replaced the chair immediately after a quick discussion through chat. Very happy with this purchase. The chairs are very cool. Hand sewn details and firm, resilient construction give this chair a wonderful longevity that can be enjoyed year after year. 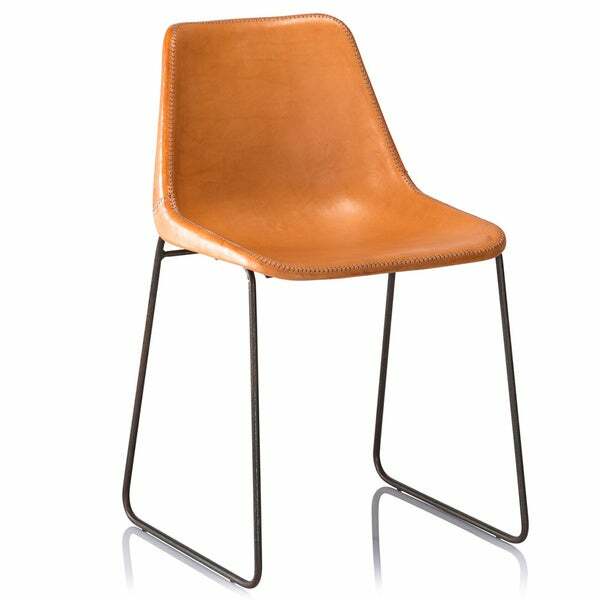 The tan leather is met with a matte black frame for a graceful look that uplifts any decor. "Is the chair currently being made, and is their any cost incentive in buying 4 chairs in a single purchase ?" "How high is the seat? And is this more of an orange leather, or brownish/caramel leather?" The tan chair has an 18 inch seat height.